Japanese gaming magazine Famitsu has today revealed that Nintendo is set to announce plans to release a Nintendo 3DS attachment that will provide players with the ability to use a second Circle Pad alongside four shoulder buttons. 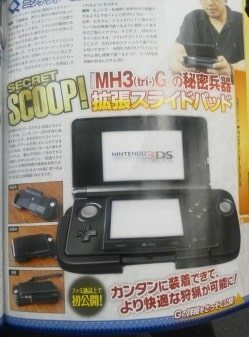 It is rumoured to be known as the Nintendo 3DS ‘Expansion Slide Pad’. Nintendo are therefore expected to detail this hardware attachment at a pre-Tokyo Game Show conference next week, yet a scan of Famitsu suggests that the handheld will sit in a cradle of sorts that then allows you to enjoy such additional functionality.